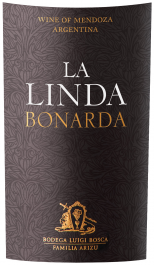 Luigi Bosca’s Finca La Linda range represents the pure expression of each varietal. Reds see minimum use of oak, while the whites are aged exclusively in stainless steel resulting in clean, fresh, fruit driven wines. Terroir: Sourced from Bosca’s Don Leoncio and Barrancas vineyards in the Maipu region of Mendoza. Vines average 10 years and sit at an elevation of 780 meters. Soils here are well drained and shallow based with a mix of clay, limestone and silt. Ruby red color, with aromas of red fruit, dry fig, and a touch of wood contributed by 3-month aging in American oak casks. Full-bodied, round and velvety, with a good finish in the mouth. Its soft and ripe tannins lend it a distinguished personality.